Founded in 2014, Atlanta United began play as an MLS expansion team in 2017, as the twenty-second team in the league. It is the first MLS franchise to be based in Atlanta, and the club plays home games at the Mercedes-Benz Stadium, which they share with the city's National Football League (NFL) franchise, the Atlanta Falcons. Both are owned by Arthur Blank, co-founder of The Home Depot. The club also owns Atlanta United 2, a reserve team that competes in the USL Championship (USLC). Gerardo "Tata" Martino was appointed as the club's first head coach, and guided Atlanta to their first playoff appearance in the team's debut season, before securing the team's first trophy in just their second season by winning MLS Cup 2018. Based on 2018 regular season attendance, Atlanta has one of the largest fanbases in MLS, and they have set several league records for highest single-match and average attendance. In 2018, Forbes estimated the franchise was the most valuable in the league, worth more than $300 million. At the time the team was announced, Atlanta was the largest metropolitan area without an MLS franchise. 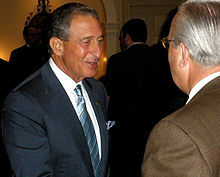 Atlanta Falcons owner Arthur Blank's AMB Sports and Entertainment Group had submitted a bid for an expansion franchise in 2008, but withdrew the bid in early 2009 due to state and local government budget shortfalls and Blank's inability to find partners to build an appropriate stadium for the proposed team. On July 10, 2010, Dan Courtemanche, MLS's executive vice president of communications, said that despite the bid withdrawal, regular discussions with Blank regarding Atlanta's potential as an expansion market were occurring. On May 31, 2011, the NHL's Atlanta Thrashers were sold to True North Sports & Entertainment, who announced that they would relocate the team to Winnipeg and rebrand as the Winnipeg Jets. The Thrashers' relocation helped restart the efforts and talks of bringing an MLS expansion team to Atlanta. In May 2012, while the Falcons' proposed new stadium was going through the approval process, MLS commissioner Don Garber cited Atlanta as one of three "intriguing" markets for future league expansion. Additionally, when Blank presented his case for a new stadium at the Falcons' annual meeting with season ticket holders, he stated that an additional benefit of the new stadium was that it could help attract a Major League Soccer franchise and potentially host World Cup matches. Later that year, in November, Garber said that if the Falcons could complete plans for a new stadium, MLS would "try to figure out how an MLS team could be part of their plans." Rich McKay, Falcons president and CEO, said in 2013 that the team was "open to various options, including [its] ownership of a team or someone else owning a team". Dan Courtemanche said, "We are big believers in the Atlanta market," and cited the city's growing Hispanic population and corporations that could serve as its sponsors. Then, in March 2013, the city and the Falcons agreed to financing terms, and in May 2013, the Georgia Department of Economic Development board approved $30 million in bonds to finance the land purchase for the new stadium. The stadium was set to open in 2017 and could be configured for professional soccer. Atlanta remained at the top of the list for an MLS expansion team, as Garber, in the December 2013 MLS State of the League address, emphasized that it was a goal to continue to expand in the Southeast, and added, "if we can continue to advance our discussions positively with Arthur [Blank] and the [Atlanta] Falcons, we hope to be able to get a situation finalized so that could potentially be our second team. Orlando being the first, maybe Atlanta or Miami would be the second or the third." In December 2013, Garber said the league was making progress in discussions with the Falcons and that the stadium situation was finalized. Negotiations continued, as Courtemanche said in January 2014 that Atlanta "remains a great prospect for MLS expansion," and in February 2014, Rich McKay confirmed the parties were "far along in negotiations." On April 16, 2014, Blank announced that MLS had awarded an expansion franchise to his group, and the team would begin play in 2017. Atlanta became the second franchise awarded in the Southeastern United States in five months, following the Orlando City SC announcement in late 2013. The Southeast had been without an MLS team since the Miami Fusion and Tampa Bay Mutiny were dissolved in 2001. Atlanta's first regular season MLS game was played on March 5, 2017 at Bobby Dodd Stadium with 55,297 in attendance. Yamil Asad scored the first goal in team history in a 2–1 loss to New York Red Bulls. A week later, the team registered its first win with a 6–1 away defeat of fellow expansion team Minnesota United FC. On March 18, 2017 the team registered its first win at home, beating Chicago Fire, who went down to ten men in the eleventh minute, 4–0 in front of a sold-out Bobby Dodd Stadium. Following its move to Mercedes-Benz Stadium, the team continued leading the league in attendance and averaged more than 48,000 in its home league matches, breaking records for attendance for a non-doubleheader MLS game and average single-season attendance for a U.S. soccer team. Atlanta clinched a berth in the playoffs, becoming the third MLS expansion team to do so in their inaugural season, by finishing tied for third place in the Eastern Conference; due to tiebreaking rules Atlanta was seeded fourth. In its first playoff game, the team faced Columbus Crew and set a then-MLS attendance record for a playoff game with 67,221 spectators in attendance. After 120 minutes of scoreless action, the match was decided by a penalty shoot-out, which Columbus won 3–1 to eliminate Atlanta. In their second season, Atlanta finished second in the Eastern Conference as well as the Supporters Shield. The club qualified for the playoffs for the second year in a row, advancing to MLS Cup 2018 after beating New York City FC and New York Red Bulls. In the final on December 8, the team beat Portland Timbers, bringing the city of Atlanta its first major sports championship since MLB's Atlanta Braves won the 1995 World Series. The win qualified Atlanta for the 2019 CONCACAF Champions League, marking the first time Atlanta qualified for continental competition. The win also allowed Martino, who had announced earlier in the season that he would not return for the 2019 campaign, to end his two-year tenure on a high note. Josef Martínez was named league MVP, while Martino was named Coach of the Year. Arthur Blank stated that fans would be involved in choosing the name, logo and "a color scheme that'll work with the red and black with ... gold " (the colors used by the Falcons when they launched in 1966). On June 25, 2015, Sports Illustrated reported that Atlanta's expansion team would be named Atlanta United FC. The official announcement of the team's name took place on July 7. Atlanta United president Darren Eales explained that the name was chosen based on a survey of the team's supporters and used words the supporters most positively related to the potential team. Eales also stated that the Founders' Group meeting would still be held on July 7 and the logo for the new team would be unveiled. The team's name, logo and colors were unveiled on July 7, 2015. The logo features a circle reminiscent of the city's seal and Olympic heritage with a bold "A" at the center of the circle. Behind the "A" are five black and red stripes representing the five pillars of the team: unity, determination, community, excellence and innovation. The team's official colors are black (for strength and power), red (or "Victory Red," as the team calls it, for pride and passion), and gold (for a commitment to excellence). The team has become unofficially known as "The Five Stripes" based on the five stripes on the team's inaugural home kits. In February 2019, on the heels of the club's first MLS championship, Atlanta unveiled a new primary kit for the upcoming 2019 season. The new design is nicknamed "Star and Stripes" and was created by Adidas. Changes include a move from five thick stripes to nine thinner stripes on the front, red socks instead of black, and a gold star above the team crest. On July 12, 2016 the team announced American Family Insurance as its primary jersey sponsor for the first team. The terms and length of the contract were not disclosed. SunTrust is the official kit sponsor at the youth academy level. The reserve team currently does not have a shirt sponsor. On November 14, 2017, Atlanta United announced that they would be launching a reserve team to compete in the United Soccer League, the second division of American soccer. Club president Darren Eales said that the new team was launched to "bridge the gap between our best in class academy and our First Team." The team, Atlanta United 2, began play in the Eastern Conference of what is now called USL Championship in the 2018 season. Atlanta United operate a youth academy that competes in the United States Soccer Development Academy. The academy began play in the 2016–2017 USSDA season and has seven youth teams: U-19, U-17, U-16, U-15, U-14, U-13 and U-12. Participation in the academy is free for all players and participants are eligible to be signed to the Atlanta United first team as a Homegrown Player. The club has signed five players to first team contracts and three players to reserve team contracts since the academy launched. In addition to its USSDA programs, the academy also operates a soccer development program to identify players playing for local youth clubs and promote them to the academy. The club also operates the Atlanta United Regional Development School, a pre-academy feeder program for players aged 8–14 to provide training and development for advanced local players and identify potential academy players, as well as the United Juniors Program, a special development program to provide supplemental development for U-12 players playing for other Atlanta-area youth clubs. The club shares Mercedes-Benz Stadium with the NFL's Atlanta Falcons. The club typically curtains off the upper level of the stadium to create a more intimate atmosphere for soccer. For most games, Mercedes-Benz Stadium holds 42,500 people. The team used the curtains for six of nine home matches during the inaugural season. When expanded to full capacity, the stadium can hold 71,000 people, with standing room for at least 73,019 people (based on attendance at MLS Cup 2018). To create a better match-day experience, stands are retractable to accommodate a larger field and allow better sight lines. When Atlanta was announced as an expansion team, Blank vowed, "There will never be an MLS game in Atlanta where NFL lines are shown on the field" – a previous point of contention for teams that have played in stadiums primarily used for American football. In January 2016, the opening of the stadium was delayed three months to June 2017. The team was originally scheduled to move into Mercedes-Benz Stadium on July 30, 2017; however, the complexity of the eight-panel retractable roof caused another delay in the stadium's opening. As the team could not use Bobby Dodd Stadium in August due to Georgia Tech having priority, the match against Orlando City was moved up one day from July 30 to 29, and two home fixtures originally scheduled to be held at Mercedes-Benz Stadium in August were moved to September. The team's first match in the stadium took place on September 10, 2017, against FC Dallas. In August 2015, the club announced plans for training facilities, academy facilities, and sporting headquarters in Decatur. However, the results of an environmental and geotechnical feasibility studies found that the site on Memorial Drive was unfeasible, and in November 2015 plans for the facility were canceled. Instead, the facility was built on a 32-acre plot on Franklin Gateway in Marietta. On April 11, 2017, the $60 million facility was opened, named the Children's Healthcare of Atlanta Training Ground. The facility includes a 30,000 square foot building that acts as the club's sporting headquarters and houses locker rooms for the first team, reserve team, and academy teams, a full-service dining hall, and sports science facilities including a gymnasium and two hydrotherapy plunge pools. The facility also includes six outdoor training fields, including a showcase field with a stand that can seat 2,500 spectators. A view of Bobby Dodd Stadium, where Atlanta United played part of its inaugural season in 2017. The first team played its home matches in the first half of the 2017 MLS season at Georgia Tech's Bobby Dodd Stadium due to delays in the construction of Mercedes-Benz Stadium. Although the club sought a balanced home-and-away schedule during their spell at Bobby Dodd Stadium, Atlanta United did not play any home matches from March 19 to April 29 to avoid conflicts with the Yellow Jackets' spring football scrimmages. According to club officials, the Georgia Dome was not considered a viable option to temporarily host the team, since delaying the Dome's planned demolition would have also delayed the completion of Mercedes-Benz Stadium. Atlanta United currently has four Supporter Groups identified on their homepage: Terminus Legion, Resurgence, Footie Mob, and the Faction. Terminus Legion is a supporter group that was created in March 2011 by graphic designer Matt Stigall, who wanted a way to show that Atlanta fans would support soccer despite the perception of the city as a "lazy sports town". The group was named after the name given to Atlanta when it was first settled, and its logo featuring a cow catcher and railroad ties reflect the city's history as a locomotive hub. In the days since the expansion team was awarded, its membership doubled to over 500, and in the time leading up to 2017, Stigall said the group would support "all Atlanta soccer" including the Atlanta Silverbacks of the NASL and at the grassroots level, and make road trips to rival Orlando City matches. Footie Mob is a tailgate group established in 2014, their name a take on Atlanta hip-hop group Goodie Mob. The group is known for pre-game tailgating and incorporating Atlanta's music culture into the supporter culture. By December 2015, the supporters of the new MLS team had already pledged to purchase more than 29,000 season tickets. As of December 2017, the team had more than 36,000 season ticket holders. On September 12, 2017, Atlanta United announced that the team had sold more than 69,256 tickets for the September 16 match against Orlando City at Mercedes-Benz Stadium, breaking the league record for single-match attendance. The previous record of 69,255 tickets sold was held by LA Galaxy. The game's official attendance was 70,425, making Atlanta the first MLS team to surpass 70,000 in attendance for a non-doubleheader match. On October 5, 2017, the team announced they had sold more than 70,456 tickets for the October 22 match against Toronto FC. This allowed the team to break both the record for highest average attendance in a season for MLS (held by Seattle Sounders), as well as the record for highest average attendance in a season for professional soccer in the United States, which was held by New York Cosmos. The game's official attendance was 71,874, which broke the MLS single-match attendance record for a second time. Atlanta finished the season with an average attendance of 48,200 for MLS regular season games, a number higher than that of multiple major clubs such as English sides Everton and Chelsea. On March 11, 2018, the team broke the league single-match attendance record for the third time, selling 72,035 tickets for their 2018 season home opener against D.C. United. On June 30, 2018, fans set another record with 71,932 in attendance, more than any other soccer game happening that day in the world, including the 2018 FIFA World Cup in Russia. On July 15, 2018, the team again set the league single-match attendance record with 72,243 in attendance. As of October 21, Atlanta United currently holds the top seven single-game regular-season attendance records in MLS. Atlanta broke the league record for average regular-season attendance again in 2018, breaking their 2017 record and becoming the first MLS team to average more than 50,000 in attendance with an average attendance of 53,002. On December 8, 2018, Atlanta United won its first MLS Cup before a crowd of 73,019, the largest non-doubleheader crowd in league history. During their inaugural season, Atlanta United introduced a ritual called the Golden Spike in a nod to the city's railroad history. Prior to the game, players and supporters sign a large golden railroad spike, which is then marched into the stadium by supporters and hammered into a platform by a local VIP. Additionally, after each game, the player voted as the game's Man of the Match hammers a spike. Local celebrities that took part in the Golden Spike tradition during 2017 included hip hop artists 2 Chainz, Yung Joc, and Waka Flocka, as well as country musician Zac Brown, retired Atlanta Braves star Andruw Jones, and Atlanta basketball players Tiffany Hayes and Dennis Schröder. Atlanta native rap artist Archie Eversole also participated in the Golden Spike tradition and would later compose a rap anthem for the club entitled "United We Conquer." In 2018, notable celebrity participants included singer T-Pain, Dutch soccer legend Edgar Davids, Atlanta multi-sports star Brian Jordan, boxing legend Evander Holyfield, and rappers Jeezy, Killer Mike, and Big Boi. At MLS Cup 2018, owner Arthur Blank hammered the Spike. Atlanta United FC operates as a component of AMB Sports & Entertainment, a subsidiary of AMB Group that includes Atlanta United, the Atlanta Falcons and Mercedes-Benz Stadium. Arthur Blank owns Atlanta United FC. The chief owner of AMB Group is Arthur Blank, an American businessman and a co-founder of The Home Depot. On February 10, 2017, Atlanta United announced that the number 17 would be reserved for the fans. The number marks the year of the team's first inaugural season in MLS. Atlanta United aims to recognize that from the very beginning, the fans, the city, and the people define the spirit and essence of this team. Rights to all Atlanta United FC first team matches not broadcast by MLS' national television partners are held by Fox Sports Networks. Most of the team's games are televised by either Fox Sports South or Fox Sports Southeast, which also carry team programming. A small number of matches will be broadcast on over-the-air television by WUPA in the event of scheduling conflicts with the two channels. Financial details of the deal were not disclosed. Kevin Egan is the team's television play-by-play announcer. Former MLS defender Dan Gargan is the color commentator and Jillian Sakovits is the pre- and post-game show host and sideline reporter. Radio rights are held by WZGC/92.9 The Game. Commentators are Mike Conti (play-by-play) and Jason Longshore (color). Rights to Atlanta United 2 matches are held by ESPN as part of the USL's broadcast agreement. Games are streamed online on ESPN+ with Jon Nelson as the play-by-play announcer and Jason Longshore as color commentator. ^ a b c Roberson, Doug (December 9, 2018). "Atlanta United sets MLS Cup attendance record". The Atlanta Journal-Constitution. Retrieved December 9, 2018. ^ Smith, Chris (November 14, 2018). "Major League Soccer's Most Valuable Teams 2018: Atlanta United Debuts On Top". Forbes. Retrieved December 9, 2018. ^ a b c "Atlanta Lands MLS Expansion Team for 2017". Fox Sports. Associated Press. April 16, 2014. Retrieved April 16, 2014. ^ "Falcons owner Blank puts in bid for MLS franchise". USA Today. October 14, 2008. Retrieved June 7, 2012. ^ Manasso, John (January 16, 2009). "Blank withdraws MLS soccer team bid". Atlanta Business Chronicle. Retrieved August 27, 2018. ^ Roberson, Doug (July 15, 2010). "Atlanta may be considered by potential MLS owner". The Atlanta Journal-Constitution. Retrieved June 7, 2012. ^ "Thrashers headed to Winnipeg". ESPN. June 1, 2011. Retrieved June 7, 2018. ^ Lamle, Keaton (August 21, 2017). "46,000 fans a game: Atlanta United's strange success far from soccer's heartland". The Guardian. Retrieved April 15, 2018. ^ Lalas, Greg (May 11, 2012). "MLS monitoring "intriguing" expansion cities after NY". Major League Soccer. Retrieved June 7, 2012. ^ Wheatley, Thomas (May 17, 2012). "Blank to season-ticket holders: new stadium could bring Major League Soccer team, benefit nearby neighborhoods". Creative Loafing Atlanta. Retrieved February 15, 2014. ^ Goff, Steven (November 26, 2012). "MLS commissioner's state of league". The Washington Post. Retrieved August 8, 2018. ^ a b c Amy, Wenk; Maria Saporta (April 26, 2013). "Falcons CEO: Atlanta needs MLS team". Atlanta Business Chronicle. Retrieved December 3, 2018. ^ "Terms for Falcons stadium reached". ESPN. Associated Press. March 7, 2013. Retrieved December 3, 2018. ^ Trubey, J. Scott (May 23, 2013). "Bonds approved for Falcons stadium land purchase". The Atlanta Journal-Constitution. Retrieved December 3, 2018. ^ Galarcep, Ives (December 3, 2013). "GARBER REAFFIRMS MIAMI, ATLANTA AS EXPANSION FAVORITES". Soccer by Ives. Retrieved December 3, 2018. ^ Straus, Brian (September 13, 2013). "MLS expansion team likely heading Atlanta's way". Planet Fútbol. Sports Illustrated. Archived from the original on May 13, 2014. Retrieved December 3, 2018. ^ Borg, Simon (December 3, 2013). "MLS commissioner Don Garber discusses expansion, scheduling in latest State of the League address". Major League Soccer. Retrieved December 3, 2018. ^ Roberson, Doug (January 28, 2014). "Atlanta remains a candidate for MLS expansion". The Atlanta Journal-Constitution. Retrieved February 15, 2014. ^ Stafford, Leon (February 6, 2014). "Atlanta remains a candidate for MLS expansion". The Atlanta Journal-Constitution. Retrieved February 15, 2014. ^ a b Creditor, Avi (April 16, 2014). "MLS awards 2017 expansion franchise to Atlanta, owner Arthur Blank". Sports Illustrated. Archived from the original on April 17, 2014. Retrieved April 16, 2014. ^ "Atlanta United FC vs. New York Red Bulls – MatchCenter Boxscore". Major League Soccer. March 5, 2017. Retrieved March 7, 2017. ^ Ruthven, Graham (March 13, 2017). "Cold open: Minnesota United brutally exposed as ill-equipped for the task". The Guardian. Retrieved October 22, 2018. ^ "Atlanta United 4, Chicago Fire 0". Major League Soccer. March 18, 2017. Retrieved March 18, 2017. ^ "Columbus Crew win MLS playoff thriller in shootout vs. Atlanta United". USA Today. Associated Press. October 26, 2017. Retrieved January 7, 2018. ^ Roberson, Doug (October 23, 2018). "Manager Gerardo Martino leaving Atlanta United". The Atlanta Journal-Constitution. Retrieved November 4, 2018. ^ Bogert, Tom (December 5, 2018). "Atlanta United's Josef Martínez wins 2018 Landon Donovan MLS MVP award". Major League Soccer. Retrieved December 5, 2018. ^ "Atlanta United's Gerardo "Tata" Martino named 2018 MLS Coach of the Year". Major League Soccer. November 13, 2018. Retrieved November 13, 2018. ^ Singer, Mike (April 16, 2014). "MLS awards Atlanta, Falcons owner Blank new team for 2017". CBS Sports. Retrieved May 29, 2014. ^ Straus, Brian (April 18, 2014). "Former Crew GM, current Falcons VP confident Blank, MLS will be fruitful combo". Sports Illustrated. Archived from the original on April 23, 2014. Retrieved May 29, 2014. ^ Straus, Brian (June 25, 2015). "Atlanta United FC: MLS's 2017 expansion team selects its name". Sports Illustrated. Retrieved June 5, 2015. ^ a b Roberson, Doug (June 25, 2015). "Eales: Atlanta United FC name is 'authentic'". The Atlanta Journal-Constitution. Retrieved June 26, 2015. ^ Borg, Simon (June 25, 2015). "Atlanta United FC: Get the lowdown on the newest team name in MLS, as selected by the supporters". Major League Soccer. Retrieved June 25, 2015. ^ "MLS expansion team Atlanta United FC unveil logo, club colors and new hashtag #ATLUTD". Major League Soccer. July 7, 2015. Archived from the original on July 10, 2015. Retrieved July 7, 2015. ^ "About The Club". Atlanta United FC. July 11, 2016. Retrieved November 20, 2016. ^ McQuade, Alec (March 5, 2017). "10 things you need to know about Atlanta United FC". WXIA. Retrieved March 5, 2017. ^ Roberson, Doug (February 16, 2019). "Atlanta United unveils new primary kit". The Atlanta Journal-Constitution. Archived from the original on February 17, 2019. Retrieved February 17, 2019. ^ "Atlanta United unveil new primary jersey ahead of 2019 season". Major League Soccer. February 16, 2019. Archived from the original on February 17, 2019. Retrieved February 17, 2019. ^ Longshore, Jason (July 12, 2016). "Atlanta United reveal first jersey sponsor in club history". Dirty South Soccer. SB Nation (Vox Media). Retrieved July 13, 2016. ^ Usry, Rob (May 5, 2016). "SunTrust named Atlanta United Academy kit sponsor". Dirty South Soccer. SB Nation (Vox Media). Retrieved July 13, 2016. ^ "Atlanta United to Field USL Team in 2018". United Soccer League. November 14, 2017. Retrieved July 28, 2018. ^ "About the Atlanta United Academy". Atlanta United FC. June 16, 2018. Retrieved June 16, 2018. ^ "Academy Graduates". Atlanta United FC. June 16, 2018. Retrieved June 16, 2018. ^ "Soccer Development Program". Atlanta United FC. July 6, 2017. Retrieved June 16, 2018. ^ "Atlanta United Regional Development School". Atlanta United FC. October 29, 2018. Retrieved October 29, 2018. ^ Roberson, Doug (September 7, 2017). "Atlanta United hopes fan bring the noise to Mercedes-Benz Stadium". The Atlanta Journal-Constitution. Retrieved September 7, 2017. ^ Borg, Simon (January 22, 2016). "Opening of Atlanta United FC's Mercedes-Benz Stadium pushed to June 2017". Major League Soccer. Retrieved January 22, 2016. ^ "Roof construction delays Mercedes Benz Stadium opening". USA Today. Associated Press. April 18, 2017. Retrieved June 5, 2017. ^ Roberson, Doug (April 18, 2017). "Atlanta United president understands fans' frustration". The Atlanta Journal-Constitution. Retrieved April 21, 2017. ^ "Atlanta United FC unveil plans for state-of-the-art training facility and team headquarters". Major League Soccer. August 5, 2015. Archived from the original on August 8, 2015. Retrieved August 6, 2015. ^ Kahn, Michael (November 9, 2015). "Atlanta United Calls Off Memorial Drive Development". Curbed Atlanta. Retrieved June 17, 2018. ^ "Children's Healthcare of Atlanta Training Ground". Atlanta United FC. August 3, 2016. Retrieved June 16, 2018. ^ Stejskal, Sam (October 5, 2016). "Atlanta United to open 2017 season at Georgia Tech's Bobby Dodd Stadium". Major League Soccer. Retrieved November 6, 2016. ^ Roberson, Doug (October 5, 2016). "Atlanta United will play first home games at Georgia Tech". The Atlanta Journal-Constitution. Retrieved October 5, 2016. ^ Roberson, Doug (October 6, 2016). "Atlanta United won't play at Georgia Tech in most of April". The Atlanta Journal-Constitution. Retrieved October 18, 2016. ^ "Tickets FAQ–Atlanta United FC". Atlanta United FC. August 3, 2016. Retrieved December 9, 2016. ^ "Supporters Groups | Atlanta United FC". Atlanta United FC. July 11, 2016. Retrieved February 18, 2017. ^ Borg, Simon (April 18, 2014). "Meet the newest MLS supporters group: Atlanta's Terminus Legion". Major League Soccer. Retrieved May 29, 2014. ^ West, Phil (May 23, 2017). "ATL's Footie Mob SG has married music, soccer culture from the start". Major League Soccer. Retrieved January 7, 2018. ^ Usry, Rob (December 3, 2015). "December 2015 Atlanta United season ticket deposit update". Dirty South Soccer. SB Nation (Vox Media). Retrieved January 19, 2016. ^ Roberson, Doug (November 21, 2017). "Atlanta United surpasses 36,000 in season ticket sales". The Atlanta Journal-Constitution. Retrieved June 18, 2018. ^ Stejskal, Sam (September 14, 2017). "Atlanta set all-time MLS single-game attendance record with 70,425 fans". Major League Soccer. Retrieved October 6, 2017. ^ Rodriguez, Alicia (October 5, 2017). "Atlanta United FC set to break MLS attendance record, again". Major League Soccer. Retrieved October 6, 2017. ^ "Atlanta United sets MLS attendance records for single season and game". ESPN FC. ESPN. October 22, 2017. Retrieved October 23, 2017. ^ Roberson, Doug (October 6, 2017). "Atlanta United will break 3 attendance records". The Atlanta Journal-Constitution. Retrieved October 6, 2017. ^ "Major League Soccer 2017 – Attendance". worldfootball.net. Retrieved December 3, 2018. ^ "Premier League 2017/2018 – Attendance". worldfootball.net. Retrieved November 27, 2018. ^ Roberson, Doug (March 11, 2018). "Atlanta United sets record in defeating D.C. United". The Atlanta Journal-Constitution. Retrieved March 11, 2018. ^ Axelrod, Josh (July 2, 2018). "Forget the World Cup. On Saturday, the largest soccer crowd was in Atlanta". CNN. Retrieved July 8, 2018. ^ a b Rodriguez, Alicia (October 21, 2018). "Atlanta United set MLS season record for home attendance". Major League Soccer. Retrieved December 3, 2018. ^ Baer, Benjamin (March 7, 2017). "Atlanta's Man of the Match will now hammer the Golden Spike". Major League Soccer. Retrieved January 4, 2018. ^ "The Golden Spike by Atlanta United FC on Exposure". Exposure. October 27, 2017. Retrieved April 15, 2018. ^ Catanese, Ryan (January 3, 2018). "Behind the Stripes: Archie Eversole". Atlanta United FC. Retrieved July 28, 2018. ^ "Atlanta artist Archie Eversole releases ATL UTD themed track 'United We Conquer'". Atlanta United FC. July 17, 2018. Retrieved July 28, 2018. ^ "T-Pain hammers the Golden Spike". Atlanta United FC. May 20, 2018. Retrieved July 2, 2018. ^ Schwin, Payson (May 10, 2018). "Juventus legend Edgar Davids visits Atlanta ahead of 2018 MLS All-Star Game". Major League Soccer. Retrieved July 2, 2018. ^ Catanese, Ryan (May 25, 2018). "Behind the Stripes: Brian Jordan". Atlanta United FC. Retrieved July 2, 2018. ^ "Almiron scores twice, Atlanta United beats Orlando City 4–0". USA Today. Associated Press. June 30, 2018. Retrieved July 2, 2018. ^ "Jeezy x atl utd by Atlanta United FC". Exposure. October 9, 2018. Retrieved October 23, 2018. ^ "Behind the Stripes: Killer Mike". Exposure. July 25, 2018. Retrieved October 23, 2018. ^ "Big Boi the latest Atlanta music star to hammer Five Stripes' Golden Spike". Major League Soccer. November 26, 2018. Retrieved December 24, 2018. ^ Galarcep, Ives (December 8, 2018). "Atlanta United's championship season sets lofty new standard for MLS". Goal.com. Retrieved December 24, 2018. ^ "AMB Sports & Entertainment names Lyft Official Rideshare Partner of Atlanta Falcons and Atlanta United at Mercedes-Benz Stadium – Mercedes Benz Stadium". Mercedes-Benz Stadium. August 15, 2017. Retrieved July 28, 2018. ^ "ARTHUR BLANK – OWNER AND CEO". Atlanta Falcons. Archived from the original on January 8, 2011. Retrieved January 8, 2011. ^ "Roster". Atlanta United FC. Retrieved March 1, 2019. ^ Rossitch, Eric (February 10, 2017). "Atlanta, Number 17 is for You". Atlanta United FC. Retrieved February 10, 2017. ^ a b c d "Atlanta United 2017: The international call-ups". Atlanta United FC. November 6, 2017. Retrieved December 20, 2018. ^ Roberson, Doug (October 1, 2018). "Three Atlanta United players get international call-ups". The Atlanta Journal-Constitution. Retrieved March 14, 2019. ^ a b c "Three Atlanta United players called-up for international duty". Atlanta United FC. March 13, 2019. Retrieved March 14, 2019. ^ "BOBBY WOOD PENALTY KICK LIFTS MNT TO SPIRITED 1-0 WIN VS. PARAGUAY". U.S. Soccer. March 27, 2018. Retrieved January 31, 2019. ^ Roberson, Doug (September 3, 2018). "Atlanta United's Martinez, Williams receive international call-ups". The Atlanta Journal-Constitution. Retrieved March 14, 2019. ^ Roberson, Doug (February 21, 2017). "Atlanta United announces TV partnership". The Atlanta Journal-Constitution. Retrieved February 22, 2017. ^ Cleveland, Parker (February 22, 2017). "Analyzing the Atlanta United broadcast deal". Dirty South Soccer. SB Nation (Vox Media). Retrieved February 22, 2017. ^ Jones, J. Sam (March 15, 2018). "Meet the Newest Member of the Atlanta United Family, Jillian Sakovits". Dirty South Soccer. SB Nation (Vox Media). Retrieved June 7, 2018. ^ "Atlanta United Announces 2018 Broadcast Team". Atlanta United FC. March 1, 2018. Retrieved June 7, 2018. ^ "Welcome Mike Conti as Play-by-Play Announcer for Atlanta United Matches". CBS Atlanta. February 2, 2018. Retrieved June 7, 2018. ^ "ATL UTD 2 Announces 2018 Broadcast Team". Atlanta United FC. March 22, 2018. Retrieved July 28, 2018. ^ a b "Front Office". Atlanta United FC. Retrieved January 3, 2019. ^ a b "Atlanta United FC Player Stats". Major League Soccer. Retrieved May 11, 2018.